Inter Milan recorded a 3-1 win away at relegation battling Frosinone on Sunday to strengthen their grip on third place in Serie A. Luciano Spalletti’s side were under pressure to deliver a result in order to avoid being dragged into a tight race for Champions League qualification, after AS Roma and AC Milan won on Saturday. A header from Radja Nainggolan and an Ivan Perisic penalty in the first half put Inter in control before Francesco Cassata pulled one back for Frosinone as they improved after the break. However, Matias Vecino’s stoppage-time strike sealed a win that keeps the visitors five points clear of Milan in fourth place with six rounds remaining in the league season. Inter have 60 points, giving them breathing space from a tight-knit chasing pack of Milan (55), Roma (54), Atalanta (52), Torino (50) and Lazio (49). Atalanta and Lazio both have a game in hand. But Inter coach Spalletti had concerns about his team’s failure to kill the game off until the last few minutes. “We saw that the moment we feel remotely safe or comfortable, we can run into a devastating setback,” he said to Sky Sports Italia. “It happens to everyone, but probably more to Inter. When you think it’s all in hand, rather than finish it off, you get timid and soft. “Frosinone had nothing to lose, so their only objective was to impress and get a great result in an important fixture. 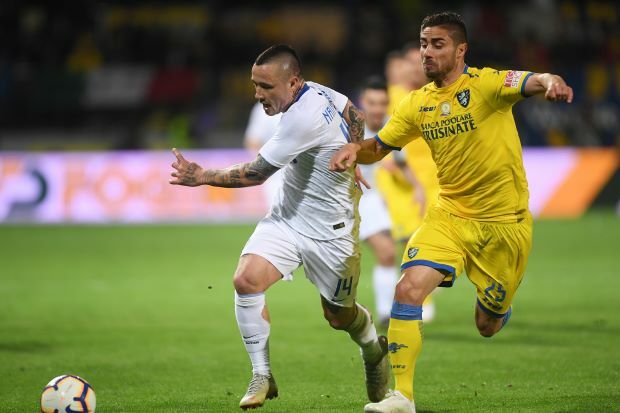 A defeat won’t make much difference to them at this point.” Frosinone went into the game buoyed by recent wins over Parma and Fiorentina, the first time the club had ever achieved back-to-back victories in the top flight. However, the second-bottom side’s hopes of producing an upset were soon dealt a blow when Nainggolan rose unopposed to head in a Danilo D’Ambrosio cross. The visitors doubled their lead shortly before halftime when Raman Chibsah hauled down Milan Skriniar in the area to concede a penalty, which Perisic dispatched in composed fashion. Frosinone were back in contention with just over an hour played when Cassata’s low strike from the edge of the box beat Samir Handanovic, despite the goalkeeper getting a hand to the shot. Inter striker Mauro Icardi headed over a great opportunity from six yards out, but Vecino put the result beyond doubt when he finished off a counter attack with a drilled shot in stoppage time. Frosinone remain in 19th place with 23 points and are two places and eight points adrift of 17th place, currently occupied by Bologna.